Red River Real Estate and Vacation Rentals - River Song, Red River, New Mexico. River Song is a beautiful cabin in the upper valley. 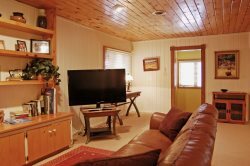 It's perfect for small families or a romantic get away. Quiet and secluded make it the perfect place to stay while in Red River, New Mexico. When you walk through the front door you will be in the main living area. The living area has a nice futon that pulls out to sleep two people. There is a wood burning fireplace There are two bedrooms on this level, one with a double bed and the other with two twin beds. There is a full bathroom with a tub in the hallway to be shared by the two bedrooms. Upstairs in the loft is a futon that can be used to sleep two and a full bathroom. There is a TV upstairs that you can use to watch DVD's. Two story cabin with only a few steps to entry. Two bedrooms on the main level plus a semi private loft. One full bed, two futons, two twin beds. Outside seating on the front porch. Living room includes wood burning fire ace, and large windows. River Song pet policy: Pet Friendly! Best ladies ever. Soooooo helpful and friendly and warm. Give them a raise or bonus. Very good, check in went very fast, and they even called to see if all was going well and we needed eneything, great job. We had a great time, very nice home. We enjoyed our stay immensely at River Song. The view from the back porch is truly stunning. We never tired of hearing the River from the house and we thoroughly enjoyed playing down by the river in the hot afternoons. Although the house could use some upgrades (new flooring is really needed along with some kitchen appliances), this did not deter us from truly enjoying our stay at the property. We would definitely stay here again. Very helpful in finding us exactly what we wanted. Answers email quickly. Personalized feeling of service. Wish we had booked for longer. Next year we will. Wasn't ready to leave. We had been to red river a few times before and stayed in a different cabin on bobcat pass. This was a better location. The creek and mountains out back are awe inspiring. Great place for a hot chocolate or glass of wine. I had both! Can't wait to come back next summer!! We loved this house. Cozy and cute. Secluded but not too far from town. And being pet friendly was important to us. That's hard to find. Thankful for that.